I tend to look forward to the avalanche of serious, high class, IMPORTANT MOVIES that overrun the box office each December, all searching for a taste of that Oscar glory. But I must admit that so far this year I've been largely disappointed. I think that the Best Actor race is going to be very hotly contested (as it usually is) and while most of these performances will absolutely deserve all that praise and more, the films themslves simply have not measured up. There's no better example of this conundrum than The Theory Of Everything. Eddie Redmayne does some astonishing work, both physically and emotionally, as the brilliant cosmologist Stephen Hawking. Watching him slowly succumb to the ravages of Lou Gehrig's Disease is a heart breaking affair and it's a wonderfully realized transformation. 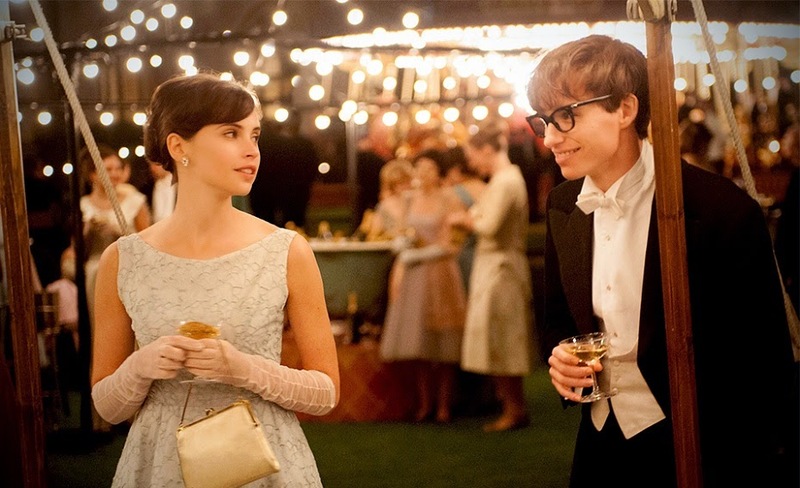 Felicity Jones matches Redmayne punch for punch as Hawking's wife Jane Wild, who is put in the unenviable position of havingtory to not only spend a lifetime caring for her crippled husband (who's initially given a prognosis of two years to live) but also raising three children without the benefit of live-in assistance. The strain and pressure that puts upon Jane, as well as the guilt the Hawking experiences over his lack of self-sufficiency, hardly makes for an ideal household. More than anything else, this is a story about the burgeoning young romance that slowly and inexorably crumbles apart. That's all well and good, but the movie never really manages to break the surface in regards to the themes, characters, their relationship, or the plot. In fact, I'm not even sure if the movie really has a plot, strictly speaking. It's more just a series of events tied together by a Rocky IV-esque number of montages. There's seemingly no bigger message to unpack here. I was hoping for something examining the price of success at the expense of family, or the ability of hope and strength to overcome incredible obstacles, or even just a keen juxtaposition of intellectual achievement set against extreme physical degradation. None of those ideas are actually present in the film, despite director James Marsh's attempt to convince you otherwise in the last ten minutes. I'm honestly left wondering if this film even needs to be about Stephen Hawking, as the film doesn't seem particularly interested in his work or personality. You could essentially tell the exact same story with fictional protagonists and the only thing that would be missing is the name recognition that sells tickets. It's a shame, because Redmayne and Jones really are doing great work and the sun-drenched cinematography by Benoit Delhomme is fairly stunning. Unfortunately, the largely hollow script by Anthony McCarten simply strands everyone, most notably the audience. This week marks the first episode of the show sans Bart. Thankfully, Jamie stepped up in his absence in order to keep the podcast train rolling. We also talk about the newly minted cast of Suicide Squad, Benedict Cumberbatch taking on the mantle of Doctor Strange, and the intriguing first trailer for the unfortunately titled Terminator: Genisys. Jamie also makes a smart suggestion which I've been contemplating for a while now. I ask you readers, would you prefer two shorter podcasts each week, one covering movie news and one examining a new film in detail, or do you like the single stream, longer format that we're currently producing? I'm open to suggestions! Next Week: Some combination of The Hobbit: The Battle Of The Five Armies and/or The Imitation Game.